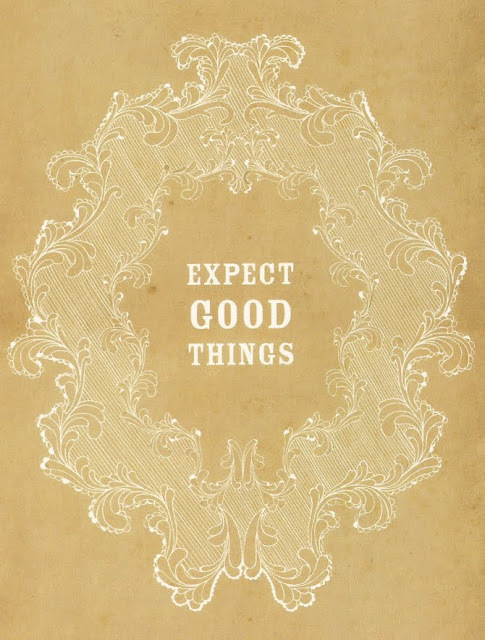 My New Year's resolution (personally and professionally) can pretty much be summed up in these three words: Expect Good Things. It's what will guide my outlook and the direction I will take this year, and beyond. I found this postcard below on Etsy a few months ago and its message has been resonating with me ever since. Given its close resemblance to Martha's favourite tag-line I sent the card to Martha a while ago with a holiday greeting on the back. Its meaning, however, is important for all of us, I feel. Expecting good things in life means having the desire to start each day with a positive outlook: "What will my good thing be today?" If we 'expect' them, we are more likely to invite them in. It doesn't mean it will come easily or that we should take good things for granted. (Sometimes finding the good things is a challenge, but the rewards are great and it makes the search well worth it.) It's more about attitude. It's about knowing you deserve good things and then setting about trying to encourage more of them in your life, sharing good things with friends and loved-ones and appreciating each and every one of them that comes your way. Happy 2011 everyone! Happy New Year Andrew. What a wonderful mantra to live by. I expect good things too for all of us this year. Thank you for your insight and cheer! I'm going to do my best to incorporate your great idea into my days. And thank you in advance for all the wonderful and beautiful posts in the coming year! What a great resolution. To all good things in 2011! Happy New Year Andrew. Looking forward to another year.